President Muhammadu Buhari, Saturday 2nd February, flagged off well drilling activities at Kolmani River Well of the Gongola Basin, in Gombe State, as part of efforts to boost the nation’s oil reserves to 40 billion, and daily production to three million barrels per day. Speaking at the flag-off of the Spud-In of Kolmani River 11 Well, Buhari insisted that the need to explore oil in the frontier inland basins remained a national priority that must be sustained for the country’s economic benefits. According to him, oil and gas remain critical to Nigeria’s economy of today and the future, just as they are key to the successful implementation of the country’s budget at all levels of government. “A key execution priority of our Economic Recovery and Growth Plan (ERGP) is ensuring national energy sufficiency and this cannot be achieved through hydrocarbon resources from the conventional basins alone. Therefore exploration in our frontier basins is a national imperative and a core policy thrust that must be sustained. “It is on this note that I directed the NNPC to aggressively intensify its exploration campaign in the inland basins to discover new hydrocarbon reserves that will boost oil and gas production and extend economic benefits to the people within the North East and the nation at large,” Buhari said.He said his administration would ensure that exploration efforts in all frontier basins of Chad, Gongola, Anambra, Sokoto, Dahomey, Bida and Benue Trough were intensified in order to usher in prospects for a more prosperous Nigeria. While the search for hydrocarbon has been on in the North for about 40 years, the journey to the hydrocarbon sand in Kolmani River started in the 1990s, when International Oil Companies (IOCs) used 2D seismic data to explore crude oil. The search led to the discovery of 146ft of hydrocarbon sand in the Kolmani River 1 well, with estimated prospect to contain about 33BCF of gas. But the IOCs however didn’t investigate deep target as their drilling was based on 2S seismic data. In 2016 and 2017, a subsidiary of NNPC, Frontier Exploration Services (FES) acquired a 3D seismic data over the Kolmani River Prospects Area in order to determine whether there is any possibility of prospects overlooked by the multinationals. The IOCs, including, Chevron, Total, and Shell, which had oil blocks in the upper Benue Trough, had drilled wells in the region. Out of the three that were drilled by the IOCs, only the block belonging to Shell had some gas reserves, but the discovery was untested. Group Managing Director of NNPC, Dr. Maikanti Baru noted that there are a number of drillable prospects, which led to the planning of the project, expected to be drilled by Ikenga 101 belonging to a consortium of service companies; Messrs Etihad Oilfield Services, and Drilog Petrodynamics Ltd, under a Turnkey Contract Agreement in order to determine the size of gas find and explore deeper targets. Baru insisted that with indications for huge prospect based on new technology being deployed and prevailing data from neighbouring countries, the group would lead the efforts across the basins before inviting the private sector. 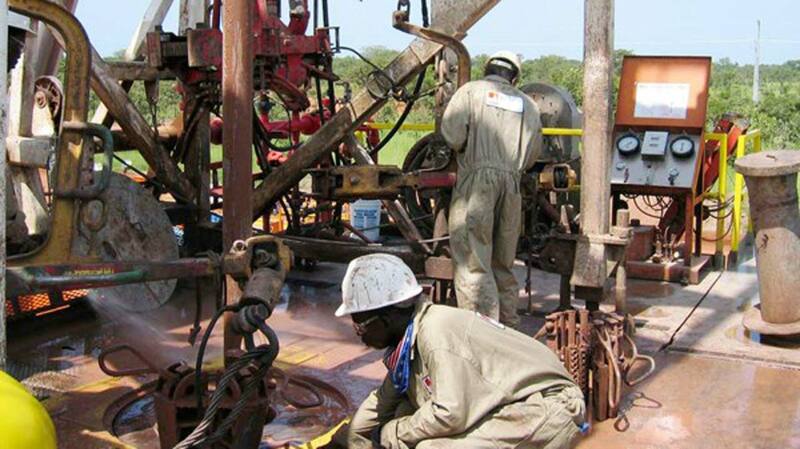 ABOUT two years ago, the corporation had started drilling activities in the Lake Chad Basin, situated in parts of Borno State but†suspended the exploration for crude oil following attacks on its workers and some military personnel by the terrorist group, Boko Haram. Some stakeholders, especially former President of the Nigerian Association of Petroleum Explorationists (NAPE), Abiodun Adesanya, a geologist and Publisher, Africa Oil and Gas Magazine, Toyin Akinosho, Director, Centre for Petroleum, Energy Economics and Law (CPEEL), University of Ibadan, Prof. Adeola Adenikinju; President of the Nigerian Association for Energy Economics, Prof. Wumi Iledare and the Technical Adviser to Nigeria Extractive Industries Transparency Initiative (NEITI), Dauda Garuba were optimistic about the new development, insisting that the country would not grow its reserves if bold steps such as exploring hydrocarbon across the country are not considered. “FES meticulously acquired necessary data and†rigorously interpreted the data going further to even subject the outcome of the interpretation to a sound peer review and collaborated with NAPE during my time as†president of the association before giving the nod to this project. No doubt the result will open the space for more exploration activities in the area and this is fantastic for national development, cohesion and respect amongst its divergent regions,” Adesanya insisted. Akinosho, who hinted that no geologist would naturally say no to any exploration, also backed Adesanya. He, however, said since private companies were unwilling to invest in inland basins, the government should open them up in order to attract international investors.In his contribution, Adenikinju noted that if†oil and gas are discovered in†commercial quantities in the region, the development†”will help in the realisation of the national goal of expanding oil reserves to 40 billion barrels and daily production capacity to three million barrels per day. Garuba corroborated†other stakeholders, insisting that the geography of the region could lead to positive results.He cautioned against politicisation of issues surrounding the search for oil across the country saying, Nigeria needs to increase its oil reserves to meet future needs. It doesn’t matter where the reserves are located, be they in the North or in the South. “Let’s stop the vain talk and unnecessary politics about the search for oil. Okitikpukpa area in present day Ondo State was where the seepage that launched Nigeria into oil search started, but the actual flow started many years later in Oloibiri in present-day Bayelsa State, and later in Ogoniland in present-day Rivers State,” Garuba stated.